Winter is slowly coming, which means that the season or sore throats and coughs is just around the corner. And the main reason why your kid suffers from those is because they are breathing in dry air. So, to avoid that, you will need a good humidifier. I swear, once you get used to these, you will want one in every room and not just the nursery. But in this post we’ll focus on humidifiers for babies, and those need to be two things: quiet and efficient. You want a humidifier that will do the job silently, and not one that will keep both you and your baby up all night! A humidifier is a simple device which adds moisture into the air we breathe in. Because the humidity of the air is not the same in all climates, and even varies from season to season, you use a humidifier to maintain the optimal air humidity. Which is around 40-50%. Sounds scary. And sounds like a good enough reason to invest in a humidifier for your nursery, right? Choosing the right humidifier can get frustrating and overwhelming, especially if you don’t know what to look for. So, here’s what you need to pay attention to, in order to get one that’s just right for you. Hot air humidifiers are called vaporizers. 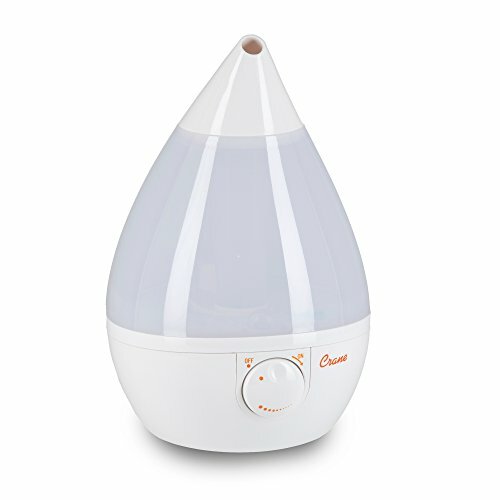 However, the term “humidifier” is often times used in the sense of a vaporizer, so be very careful when picking one out. A vaporizer has the benefit or killing bacteria with steam, which makes it more hygienic than a cold water humidifier. However, the hot steam does pose a burn risk to your child. If you decide to get a vaporizer, be sure to keep it out of reach of your kids, to ensure their safety and health. A cold water humidifier, on the other hand, is perfectly safe to use. But the cold mist doesn’t get rid of bacteria in the air, so it doesn’t have the same health benefits as a vaporizer. So, we will mostly focus on cool mist humidifiers in this particular review. But keep in mind that some of the products here also have the option of putting out warm mist. A filter has the benefit of purifying the air even more and keeping all the nasty bacteria out of the air that your baby is breathing in. However, that also means that the bacteria is being accumulated in the filter, and that you will need to clean it regularly if you want to ensure that the humidifier is doing what it’s supposed to. Some humidifiers come with filter that you can clean out, while others come with replaceable filters. And that can get expensive. A humidifier without a filter will still do a great job at maintaining the moisture in the air, but it won’t purify further. Both have their benefits – filterless humidifiers are easier to maintain, and inevitably more affordable. If you don’t have the time or don’t want to clean out or replace filters every now and then, you should get a humidifier without one. You want the humidifier to cover the entire room that you are putting it in. So, you need to pay attention to the size of its dispersion area, and compare it to the size of your room. A smaller humidifier would be okay for an average-sized room. But if you want to put it in a larger room, you will need a larger humidifier. I will list this in the product specifications section wherever possible, so be sure to check the specs out. The Crane humidifier is a cool mist humidifier that doesn’t require any filters. So, it is perfectly safe for a nursery, and it can cover an area that is up to 500 square feet. Which will definitely come in handy if your nursery is huge! One benefit of this particular humidifier is its design. The tank is shaped so that it can easily fit in any bathroom sink, and you won’t have a hard time refilling it. Which you will need to do approximately every 24 hours, if you leave it on all the time. And since the Crane is whisper quiet, you can even leave it on while your baby is sleeping – it won’t wake them up. Pretty cool, right? It also has an auto-off function, which means that the humidifier will turn off as soon as it runs out of water. So, it is also energy efficient, and I think that’s always a bonus. One last thing to note about the Crane Drop is that it is not compatible with essential oils – technically. But people have used oils with this humidifier, and it did not impact the functionality of their machine at all. Just know that you’re doing it at your own risk, and that you technically shouldn’t. 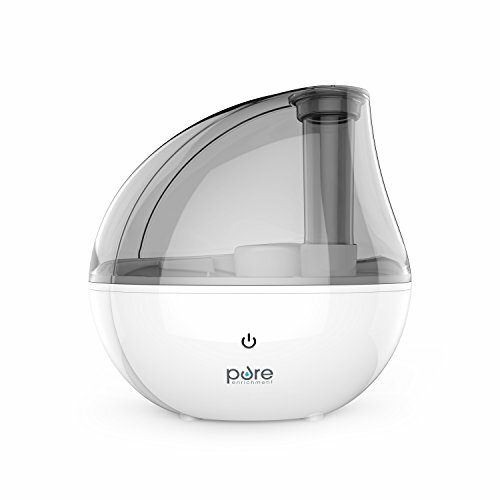 The PurSteam is another popular cool mist humidifier. It does not use a filter, which makes it easy to maintain and clean. And that’s exactly what you want, if you don’t have the time or energy to clean filters every now and then. The exact size of the dispersion area of this humidifier is not specified, but it is recommended for medium and large rooms, so about 250 square feet. One upside of this product is that it comes with a night light that you can turn on and off as you like. But it also has a tiny light which shines green whenever it is turned on, and which turns red when the PurSteam is low on water. Personally, I think that can be a little irritating. In addition to that, it is pretty quiet unless when it is taking in more water – then it makes a gurgling sound which could wind up waking your baby up. This humidifier will shut down automatically when it runs out of water, so it is pretty energy efficient. Overall it is a decent choice, and it is more affordable than the Crane Drop. But it also has a shorter run time – about 17 hours, so you will have to add water to it during the day if you want to have it on all the time. 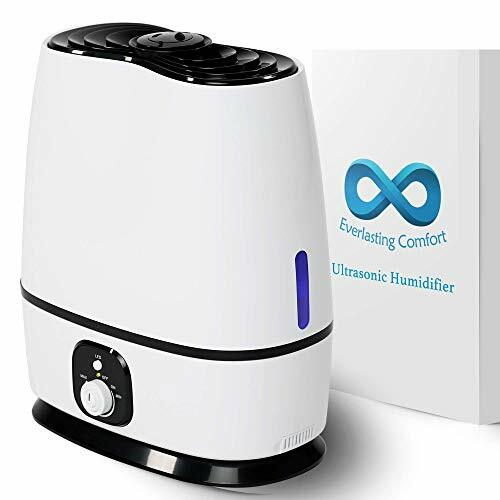 The Everlasting Comfort is a sleek and efficient cool mist humidifier. It has a 6 gallon tank, which means that it can run for up to 50 hours at a time. And that’s perfect for all of you that just don’t want to be refill it every day. 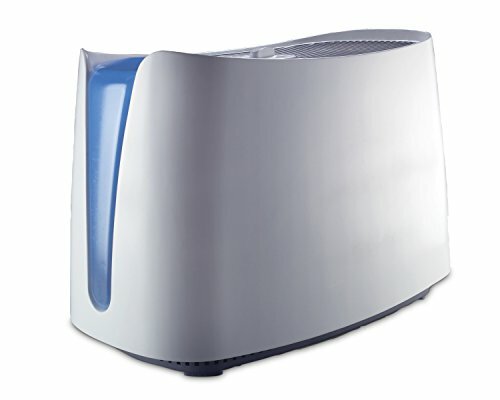 Additionally, this particular humidifier can cover an area of up to 400 square feet. It doesn’t use filters, so it is pretty easy to maintain and clean. And it allows you to completely adjust the level of humidity you want in the room you are using it, which is pretty great. The humidifier also has a night light and an indicator that tells you when it’s out of water, so it is really functional. And what is even more important, it is completely quiet and there’s no way it will wake up the baby. One upside of the Everlasting Comfort is that it is fully compatible with essential oils, and it even has a tray where you can put them. Overall, I think this is one of the best cool mist humidifiers you can find, and I especially like its sleek design. Particularly in the black color. Maybe your kid is scared or doesn’t like your current humidifier. If that is the case, then you’ll love this one – it is designed al an elephant, so it’s 100% kid-friendly. And your kids will love it. Plus, you can actually choose from a few more designs – it also comes in frog and unicorn versions. It’s actually called Crane Adorables, and I think the name suits it perfectly! 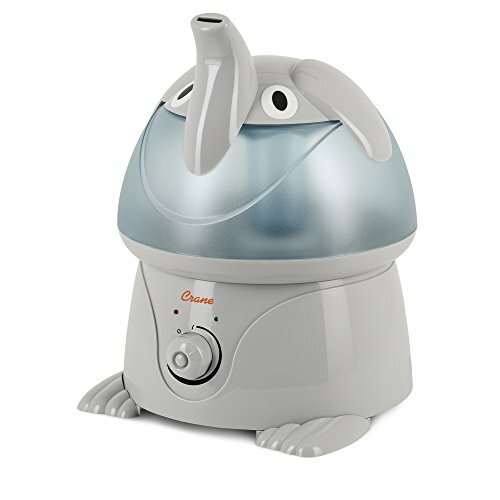 The Elephant humidifier doesn’t use any filters, so it’s super easy to clean. And it can run for up to 24 hours, which means you won’t have to fill it up more than once a day. It is also really quiet – you can barely hear it running, which is pretty important if you are going to keep it in a nursery. This humidifier will shut off automatically when it runs out of water, which makes it really energy efficient. And even though it has a weird shape, the water tank itself is easy to get out and fits in most sinks without an issue. Oh and the on indicator is pretty bright, so you will probably want to cover that up with something to not disturb your kid during the night. But overall it is a really fun-looking Crane humidifier. Its functionality was never in question. This is actually a cool mist humidifier with filters, so if you were looking for something that will kill off all the germs and bacteria in the nursery, I think this is it. For one thing the filters is uses ensures that there are no germs in the air. Additionally, the UV light on the humidifier is designed to kill all the bacteria in the water. A Honeywell filter is supposed to last you 1-3 months, but you’ll be able to get three months of use out of one. And they aren’t ridiculously expensive – around $7 each, which means that you’ll have to spend less than $30 annually on them. Not bad. And that’s with the humidifier running 24 hours at a time, with a 1-gallon tank. Now the one thing that I don’t like that much about this humidifier is that it is pretty large and bulky. And it takes up a lot of space, so you can’t really just put it anywhere. But it works wonderfully, and the tank has a handle so it’s easy to carry around. And it’s really quiet and pretty easy to clean, since the parts of it that are constantly submerged in water can be easily detached and washed. Which is a huge improvement over humidifiers that have electronics in every part of them. The Mistique humidifier is a good choice if you’re looking for something small and affordable that doesn’t need filters. It is about the size of a bowling ball, so it won’t take up too much space in your home, unlike some of the other humidifiers we checked out. However, that also means it has a smaller tank and shorter run time, which is not that great. It can run for about 8 hours at a time on the low setting, and you will have to refill it a few times a day if you want this running constantly. But the good news is you don’t really need to do that – this particular humidifier produces a lot of mist and humidity, and its effects will last even after it automatically shuts down. Which is great. And it even has different settings for the mist – you can choose if you want cool or warm mist. But keep in mind that the latter doesn’t really produce hot steam; it is just slightly less cold than the first setting. Additionally, the Mistique has several options when it comes to the color of its night light. Which can really come in handy if you baby finds a particular color more soothing than the others. In terms of the downsides, I would say that the worst thing about this humidifier is that it is shaped awkwardly, and you will spill water pretty much every time you go to refill the tank. Plus you will have to hold it beneath the faucet, since it can’t stand still in the sink. 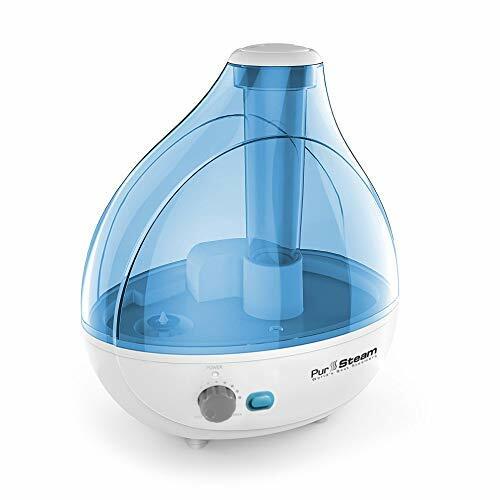 This cool mist humidifier is another good choice if you are looking for a humidifier with a filter. What’s really cool about it is that it uses a ceramic filter, which you will need to clean from time to time. But no replaceable filters, which means you won’t have to spend money on those! And when you want to clean the filter, you should soak it in vinegar for about 30 minutes and then rinse it off. Easy and quick – exactly like it should be. 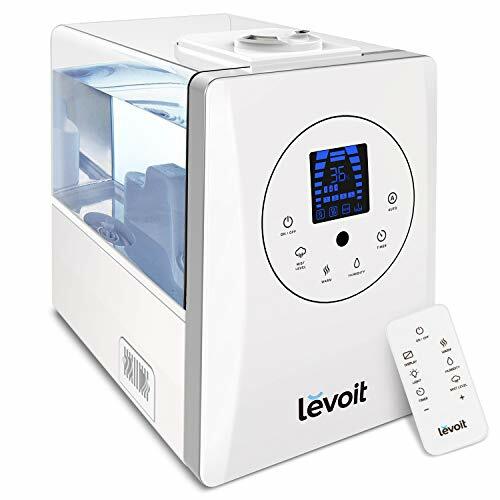 The TaoTronics humidifier also has an LED display, which tells you the level of humidity in the room. I think this is an awesome addition – no other humidifiers that we checked out so far have this feature, and they would require you to buy a humidity reader separately. It also allows you to choose between low, medium and high settings, depending on the size of your room. But generally it can cover an area that’s up to 538 square feet. Now, the downside of this product is that it is pretty large, so it might not be that easy to find a spot for it in the nursery. But at least it runs quietly, and it will shut down automatically if it runs out of water. Additionally, there will be an icon on the display to notify you that it’s time to refill it, which should happen approximately every 15 hours of run time. If you are a fan of tech and touch screens, then this is the perfect humidifier for you. Because it has a touch screen, as well as a smart run option, which means that it can read the humidity in the air and adjust the amount of mist it is putting out in order to maintain that level. And it comes with a little remote control that allows you to control it with from afar. Awesome, right? The Levoit doesn’t use any filters, which is another bonus for me. However, you will need to clean it out once a week, and that can get tiring. And I am not exaggerating – limescale builds up pretty fast inside of this thing, and it can take you about half an hour to scrub every corner of it. One way to avoid this is to use only distilled water, but you would still have to clean it on a regular basis. This humidifier allows you to choose between warm and cold mist, which is useful. And it is even compatible with essential oils! But beware – some people who bought this thing had an issue with cracked plastic and water leaking everywhere. I guess that will depend on your luck, since this only happened to a minority. But it is something you should be aware of, and if that happens contact their customer service immediately. The MistAire is one of the top, affordable humidifiers for medium and smaller rooms. It can run for up to 25 hours on low setting, which is pretty good, considering that it has quite a small tank. And it doesn’t use any filters, so you won’t have to be bothered with replacing or cleaning those out. The shape of the humidifier’s tank makes it easy to carry around and refill under the sink. Plus, since it’s not too large, it won’t get heavy when it’s completely full. And that’s a bonus, in terms of convenience of use. You can choose between low and high mist output – the first is moisture output of about 2 oz per hour, while the second release 4 oz of moisture per hour. The low setting is recommended if you plan to leave it on all night. This humidifier will shut off automatically when it’s out of water, and it has a light indicator to remind you to fill it up. It also has a night light that you can turn on and off as you please, which will certainly come in handy. Overall, it is a pretty basic and easy to use humidifier. It doesn’t really have any fancy features we saw on some other humidifiers, and if you’re a simple gal then it’s perfect for you. No fuss, and at an affordable price tag. 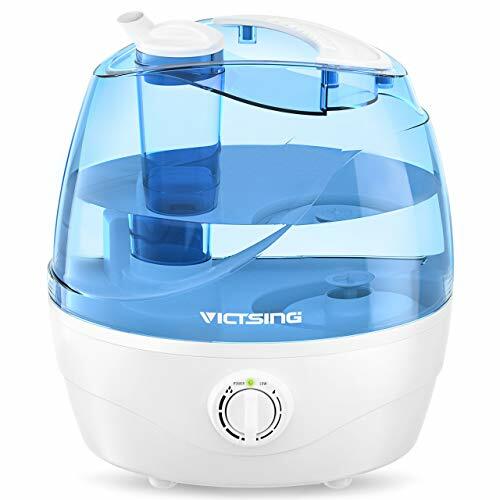 The VicSting is a no-filter cool mist humidifier for smaller rooms. With a tank of 0.5 gallons, it can run up to 24 hours on the low setting, which is okay. But what makes it stand out is the fact that the tank has a non-slip handle, which makes it super easy to refill and carry around. And the humidifier is super quiet, so there’s no chance it will wake up your baby. In fact, the manufacturer even states that it is more quiet than your average library! It also has a dial knob that allows you to adjust the level of humidity, but sadly it doesn’t come with a humidity reader like some of the other products we checked out. But it does have an indicator to notify you that it is low on water, and it will shut off automatically when the tank is empty. Keep in mind that the humidifier takes in the air from the bottom, so be sure not to place it on a towel or a blanket, because that will obstruct the airflow. In addition to that, it is not compatible with essential oils, and it doesn’t even have a night light. But it is super affordable, so you kind of get the features you pay for. Overall, it is a decent humidifier, but certainly not the best we checked out today. All of the humidifiers featured in this review are best-sellers. They have hundreds, and some even thousands or positive reviews from satisfied customers, so you’ll probably be fine whichever one you get. However, keep in mind that with certain products it is possible you will receive a faulty humidifier. You will recognize that if you have absolutely any issues with it, and if that happens be sure to return it immediately to get your money’s worth. But honestly, that’s just luck of the draw. Now, out of all these humidifiers, I think that two really stood out the most. The first is a no-filter clear mist humidifier from Crane. It is the best value for your money overall – it’s affordable, great for rooms of all sizes, and has all the necessary features to make your life easier. 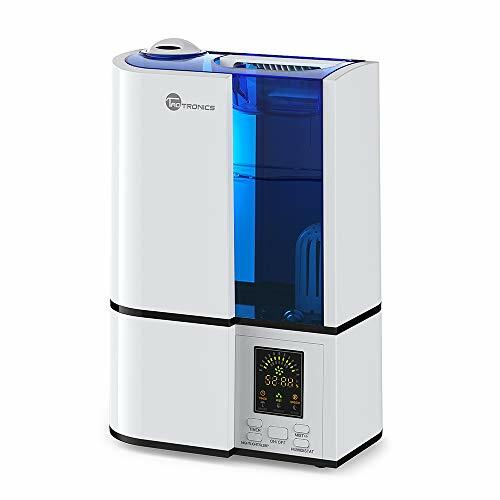 The other humidifier that really stood out for me was the TaoTronics one. It uses a filter, but one that you have to clean out and not replace every now and then. Plus it has an LED display which reads the level of humidity in the room, eliminating the need for an additional product to do that. 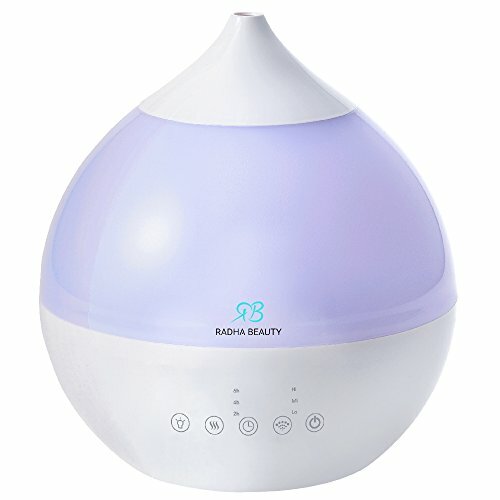 Overall, I think this is the best humidifier with a filter that you can find for the nursery. You can check out the prices of these products on Amazon, as well as see what other moms are saying about them, so be sure to head over there next!